THIS ARTICLE CONTAINS THE STATS, STRATEGY, AND GUIDE FOR RULER - JEANNE D'ARC. WE WILL UPDATE THIS AS SOON AS THE GAME COMES OUT. 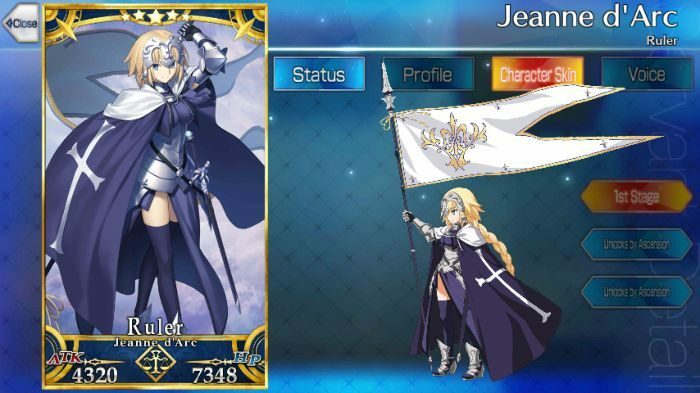 Excluding Avenger and Berserker, Jeanne d’Arc’s durability ensures that all other classes will deal minimum damage. Her NP grants a 1-turn invincibility to all allies which makes her one of the most reliable support servants in the game. When fully maxed out, her HP reaches a whopping 16000s which makes her a good counter against all other classes barring avenger, berserker and alter ego. Her Noble Phantasm is her main selling point, granting not only invincibility but also HP recovery each turn during overcharge. Be sure to raise her NP to permanently lift the effect of self-stun and inherit a special debuff effect. Focus on strengthening her Revelation Skill to reap its effects. She fulfills a tank role due to her immense durability, nominate her as Emiya (Assassin)’s Scapegoat target to redirect all enemy attacks. The trick is to assemble your Arts Cards for a chain to garner more NP, then follow up with your servants’ buffed up attacks. One of the recommended Servants to pair with her is Mash Kyrielight as they exhibit defensive synergy. Bring some Arts-type servants alongside the two to rack up the Arts Chain. As a Ruler class servant that has 3 Arts Command Cards, Formal Craft fits as one of the recommended Craft Essences to equip. It bolsters her NP’s effectiveness and damage output of Arts-type Command Cards. Once you enhance her NP, rack up the Arts Chain to maximize her NP gauge quickly. Magic Resistance EX – Heightens dispel resistance by 0.25. Revelation A 3 8 Receive Critical Stars on each turn. HP recovery for party for 2 turns. Gained notoriety for her ardent faith, Jeanne d’Arc became remembered in only a span of 2 years. France’s salvation owes it to her for her successful military advancement. Unfortunately, misfortune followed. Despite Jeanne’s imprisonment, she continued performing miracles. There have been several accounts thereafter which claim that Jeanne d’Arc was indeed a servant of God one of which appeared to the mercenary who punished her for being considered a witch. Nevertheless, others pale in comparison to Jeanne when it comes to possessing a great deal of self-discipline. Revelation is good when maxed. But since 2030 ce is not avaliable in NA yet and most player won`t be able to max passive start generation skill (Jeanne revelation, Hans innocent monster) to effectively pair with Jeanne to from Art crit team there is no point focusing your resources on it. Instead level God’s Resolution A should be prioritized. It`s good to pair Jeanne with servant who can remove the stun debuff from her NP like Martha(rider), Marie(rider) and Medea(via her 3rd skill). It means that when the strengthening quest comes to NA the NP will be available for enhancement.